Posted in: Disney, Race Recap, Running. This week we were on the Disney Dream cruise ship. On Tuesday, September 24, 2013 we stopped at Disney’s private island, Castaway Cay, in the Bahamas. Every time the Disney cruise ships stop at Castaway Cay, they have a 5k first thing that morning. It isn’t really a race, but more of a fun run. There is one clock at the start/finish line to use for your tracking. I like doing the race because you get to see a lot of the island that you normally would not see. I ran this race last year with my wife, when we stopped on the Disney Fantasy. So decided to do it again this year, as opposed to running around the deck of the ship again. We all met in Evolutions at 8:15 AM, and awaited the ship to receive clearance for us to go ashore, which happened about 8:30 AM. On Friday (9/27/13) I ran the trails of Wilderness Lodge & Fort Wilderness Lodge. I was able to log 4 miles with the course. Here is the official flier Disney puts out on the running trail, but you have a lot of options to branch off on to, to add extra mileage. Here is my Garmin data on my run, and a map of my run. Here are some pictures I took during the run. Throughout the run I saw lots of wildlife. Near the end I took a gravel trail along Bay Lake back to the Wilderness Lodge. Wilderness Swamp Trail offers runners/walkers a wonderful opportunity to enjoy the primitive nature of this part of Florida. 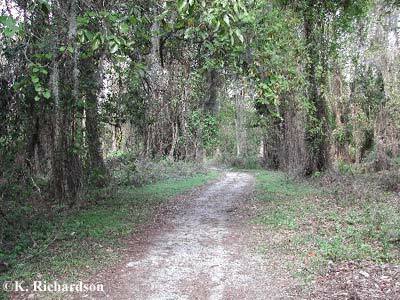 Begin at the Fort Wilderness Trading Post and follow the gravel road through the woods along the edge of Bay Lake for about 400 yards. The path crosses a small bridge, which is where the Swamp Trail actually begins. This trail winds throughout an actual swamp. All along both the path and the trail you are surrounded by cypress trees draped with Spanish Moss. The swamp trail is comprised of sandy soil which is refreshing to your legs, but can require extra care for proper footing. This part of the trail is roughly 500 yards, for a total out and back distance of approximately 1.1 miles. 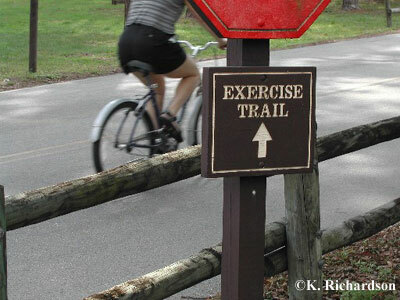 Fort Wilderness also boasts a Fitness Trail/Bike Path, which begins just past the petting farm. Crossing the road, the paved path begins. It meanders along, running parallel to West Wilderness Road, eventually arriving at Wilderness Lodge. 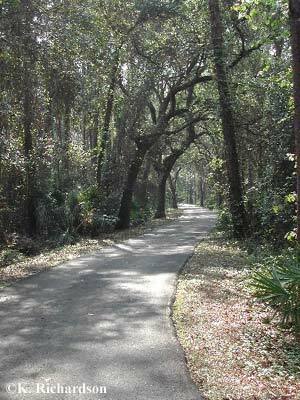 Along the way, the path is shaded by tall pine trees, covered with Spanish Moss. Because the path is shared by pedestrians and cyclists alike, caution must be used for safety. The width of the path, and the lines of sight for users of this delightful course add greatly to making it as safe as it is refreshing. The Wilderness Lodge Nature Trail begins behind the lodge at the boat rental area. As with the Swamp Trail at FW Lodge, this path is sandy soil which is very easy on your legs. The trail runs behind the Wilderness Lodge Villas, then turns right and intersects with the Fitness Trail/Jogging Path. A sign indicates that going left will take you to the FW Campground, and going to the right will take you to the bus stop in front of Wilderness Lodge. During spring and summer months, the trails and paths at both FW Campground and Wilderness Lodge will have gnats and mosquitoes. This is to be expected, as they run along Bay Lake and pass through a wetlands area. This situation will be worst during the early morning and early evening hours. 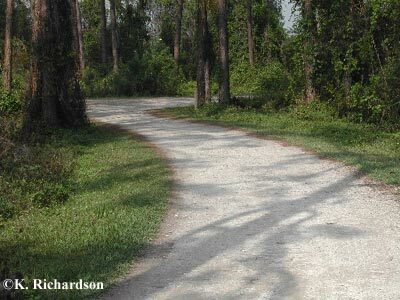 Despite this fact, these paths and trails are among the most pleasant for walking or running at any of the Disney World resorts. Because these parts are relatively well shaded, they can be suitable for use even during the hotter parts of the day, while other family members are either napping or enjoying the swimming pools. This week we did a 4 Night cruise on the Disney Dream. I tried to do some running on vacation to keep up with the amount of eating I did on the cruise. On Monday morning, as we pulled into Nassau, Bahamas, I ran 3 miles around the external jogging track of the ship. One mile on the ship takes 2.5 laps. Here is a video I did for 1 lap around the ship. I should have recorded it walking, but did it while I ran, so it is a little shaky. But you should be able to get the idea of the coolness of running around the cruise ship. With the ship running at about 15 knots, in one direction of the ship you have an awesome tailwind, where the other side is a little more challenging with a serious head wind. Tuesday (9/17): 5 mile run on the iFit treadmill at the MUSC Wellness Center. I downloaded a Google Streetview map of the Myrtle Beach Mini Marathon I will run in October to check out the course and break it up into 3 different gym runs. Saturday (9/21): 4 miles on the home treadmill before getting on the road for Florida! Florida Bound! We are headed to the Disney Dream and Disney World this week!!!!!!!!!!!!!!!!!! Tuesday (9/10): 5 mile run on the iFit treadmill at the MUSC Wellness Center. I downloaded a Google Streetview map of the Myrtle Beach Mini Marathon I will run in October to check out the course and break it up into 3 different gym runs. Saturday (9/14): This morning I ran 14 miles in Downtown Charleston. I ran the first 5 miles with my friend and coworker Tasha Ruth, and the final 9 miles with Tasha’s friend, and my new friend Kimberly, who is a NP at MUSC! Always running with my medical friends in case I fall out!!!! Kimberly is fast, so she pushed me into running faster and less walk breaks in training for my next half marathon in Myrtle Beach next month. *** ONE WEEK UNTIL OUR CRUISE ON THE DISNEY DREAM!!!!!!!!!!!!!!!!!!!!! Tuesday (9/3): 5 mile run on the iFit treadmill at the MUSC Wellness Center. I downloaded a Google Streetview map of the Myrtle Beach Mini Marathon I will run in October to check out the course and break it up into 3 different gym runs. Friday (9/6): Walked 3 miles at lunch with coworker Cat Sandifer. We walked to a new restaurant that was participating in Charleston Restaurant Week. The Alley was really cool. A restaurant that has a bowling alley built in an old warehouse. Saturday (9/7): This morning I ran 13 miles in Downtown Charleston. I ran the first 10 miles with my friend and coworker David Bundy, and the final 3 miles with my friend and coworker Tasha Ruth. It has been a while since Tasha and I had ran together, so it was good to have her out again. We all averaged a 9:35 pace, including a 30 second walk at each mile mark. Along the route I found this awesome church steeple that says so much and was so inspiring, considering it was at mile 12!!! *** TWO WEEKS UNTIL OUR CRUISE ON THE DISNEY DREAM!!!!!!!!!!!!!!!!!!!! !